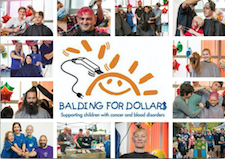 Date: May 12, 2018 - 11:00 a.m. to 4:00 p.m.
Last year's Balding for Dollars event raised over $100,000. Over 500 family members, friends, and staff gathered at BC Children's Hospital to shave their heads or cut-off their locks in support of kids with cancer and to enjoy the carnival atmosphere, which included live band, arts and crafts, a post shave photo area as well as an array of delicious goodies for the participants and supporters to enjoy. Hundreds more supporters of this event shaved their heads in similar events that took place in Whistler, Squamish, Victoria and other Lower Mainland locations, contributing to a province-wide fundraising total of more than $200,000! You can help us beat last year's total by signing up to shave/cut your hair, or hosting your own event! Sign up for Balding for Dollars today and make a difference in the lives of kids affected by cancer! in Support of Caleb Macey and his grandpa, Colin Snell. From All Rush Express Ltd.
From Cousin Noah Togyi ! !